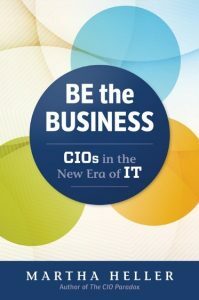 After reviewing Martha Heller’s excellent last book, The CIO Paradox: Battling the Contradictions of IT Leadership back in 2012 I was delighted to be asked to review her new book entitled, Be The Business: CIOs in the New Era of IT. The book rightly covers how technology now permeates nearly everything a company does and how regardless of industry, IT has moved much closer to (if not directly in) the revenue stream of the organisation. Martha has an amazing network of CIOs and an innate knowledge of how their roles have evolved in the past 5 years including how many leading CIOs are dramatically re-conceptualising the role of IT and creating new IT operating models as a result. In keeping with this new era of IT, these new operating models distribute IT investment decisions, innovation, delivery, and adoption throughout the enterprise, rather than keeping those activities solely within the IT function. Ultimately, these new IT operating models position the IT function as an internal professional services organisation that provides the company with a wide array of services including management consulting, customer experience, innovation, end-user productivity, and security. I have long heralded the cause for CIOs to be more progressive and deeply involved in operating and driving the business forward; Actually being a part of the core team which leads and drives the business forward rather than being content just running the technology silo and ‘keeping the lights on.’ I have referred to this more commercially focused and digitally savvy role as CIO 2.0 with more focus on supporting the business, reinvigorating its use of technology, enhancing the customer experience, driving the digital initiative and enabling it to deliver its strategic growth objectives. This book is full of practical and thought-provoking narrative on how CIOs can progress to the ‘2.0’ role in this new era of IT and each chapter resonates with illuminating quotes from leading CIOs who have been through this transition and which lend real world insight to Martha’s text. Chapters such as Step in to the Digital Void, Turn IT Consumers in Co-investors and Becoming the ‘What’ CIO invigorate the mind and really help you shape your thoughts in to meaningful and effective strategic goals that you can carry forth in to your own organisations. This book is by no means an instructional guide on how to elevate yourself as a technology leader but gently steers you in to the key areas you need to consider, investigate and embrace to succeed in this new era of IT. When digesting this book on first reading, it really resonated with me on how well it flowed and knitted together the journey to becoming a CIO 2.0. On second reading, I did so with a highlighter pen and marked out large areas of text in each chapter from which I wanted to take time to further drill down in to. I highly recommend this book and feel confident in saying that it will be a well-thumbed reference point for me that will stimulate my thoughts and interchanges with others for a long time to come.